We recently had the opportunity to go through some of the websites out there accepting manuscripts for Sci-Fi, and we ran across a few worth sharing. We don’t have personal experience with these sites, so please be sure to check them out completely before submitting to them. We always suggest looking into the pros and cons for yourself and weighing them out to be sure that you’ve made the right choice. Also, be sure to check out self-publishing as an option so that you know for sure that you’re making the right choice. We hope that each of you have lots of luck with these sites, and we wish you all the best with your Sci-Fi publishing dreams. Beacon takes unsolicited submissions across all genres. Submit a cover letter, synopsis, and a copy of your complete manuscript. Kensington has several imprints, and you’ll want to submit to the editor who best fits your needs. Send a query only in an email. Edge is a small Canadian publisher of Sci-fi and fantasy of all types. 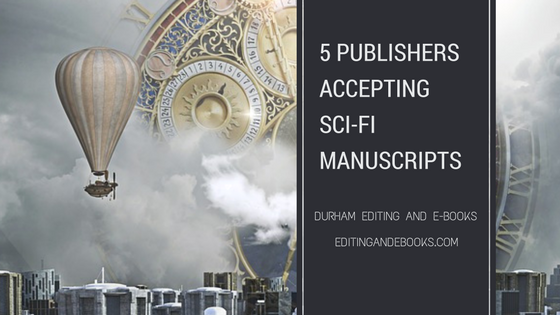 You will need to submit the extras required on their site, as well as a query letter, synopsis, title page, prologue, and chapters one through three. This site claims to want “books worth burning,” so be sure that you read more about them to see if your book fits the type of book they are seeking. Be sure to include a short biography, summary of the book, and a description of the book’s genre. Baen publishes only Sci-Fi and fantasy. Be sure to submit a complete manuscript accompanied by a synopsis.